Psychologists who conduct assessments face many ethical challenges in conducting their work. 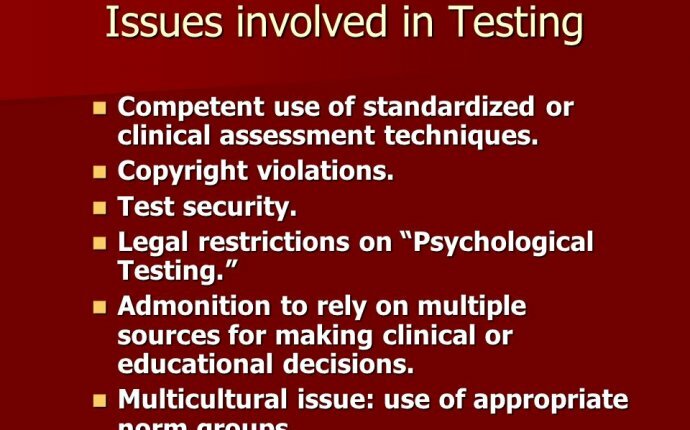 Assessment is unique among the services offered by professional psychologists because it is service seldom performed solely at the behest of a single individual. More typically, people who arrive at the psychologist's office for assessment have been sent by concerned parents or school teachers, potential employers, disability insurance companies, attorneys, or other professionals. The referring parties are invariably seeking answers to questions that may or may not be found in the analysis of psychometric data. The people being tested may benefit or suffer as a consequence of the assessment, no matter how competently it is carried out. Ethical issues arise before assessments are undertaken, during the testing process or collection of data, and after the information collected is scored, interpreted, and translated into a report. This chapter explores the ethical problems inherent in the sequence of steps involved in psychological assessment (i.e., before, during, and following the actual contact with the person being assessed). In addition, because the chapter was completed during a period of flux in the evolution of the American Psychological Association's (APA) Ethical Standards of Psychologists and Code of Conduct, proposed changes in the professional standards and the reasoning behind them are discussed. - What is Psychological Psychology?